The University of Maryland Medical Center reports that psoriasis affects approximately 6 million Americans, most of which experience the condition on the elbows, knees, groin, lower back and scalp. 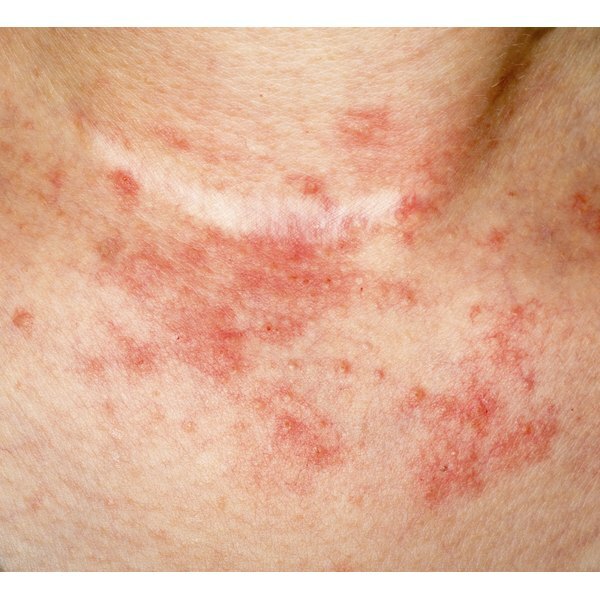 A build-up of raised, red, scaly dead skin cells is the main symptom of psoriasis, which requires careful removal with an over-the-counter topical treatment. Salicylic acid is a chemical exfoliant that effectively removes the dead skin associated with psoriasis. Wash the area of skin affected by the psoriasis with a gentle, unscented cleanser for dry skin. Massage the cleanser into wet skin, rinse with warm water and pat your skin dry with an absorbent towel. Apply a pea-sized amount of salicylic acid ointment to a clean cotton ball. Dab the cotton ball on your psoriasis patches. A thin coating of salicylic acid ointment should cover the psoriasis patches. Apply more ointment to the cotton ball, if necessary. Squeeze a dime-sized amount of medicated, dry skin cream onto the tips of your fingers. Massage the skin cream over your psoriasis once the salicylic acid ointment is completely absorbed. Repeat the process once per day. Severe cases of psoriasis may require two applications of salicylic acid per day, but because the salicylic acid can irritate your skin if used in excess, check with your physician first. Keep in mind that when it comes to salicylic acid, less is more. Applying more than necessary will not help to remove the dead skin any quicker. Salicylic acid ointments do not work overnight. It may take several weeks before you see results. The acid will slowly soften the skin and promote the natural shredding of skin. Do not exfoliate skin that is affected by psoriasis with a gritty exfoliation cream, loofah or pumice stone. Physical exfoliation can cause irritation, open wounds and bleeding in the areas where psoriasis resides. Open skin is susceptible to bacterial skin infections. Consult your physician if your psoriasis worsens or if the skin in the affected area changes color, swells or becomes extremely tender. This can be a sign of infection that will require medical intervention.